Of course, before advertisers can begin to think about marketing wearable technology, consumers have to embrace it, which brings us back to Fitbit. The household brand has been making its popular fitness trackers for nearly a decade, and launched its first global ad campaign in 2014 with Argonaut Inc. handling the creative. With upbeat spots like “Find Your Fit,” Argonaut Inc. makes the case that Fitbit trackers can enhance the lives of a variety of people—not just high-level athletes. It seems to be working. The company went public two years ago, and fitness trackers continue to be the most popular form of wearable tech. Companies in the wearable space face the dual challenge of getting the public comfortable with their product category (you have to “get” smart jewelry before you buy it) and distinguishing their particular brand. Fitness trackers have been on the scene long enough that Fitbit now has the luxury of focusing on establishing its own brand identity. Even in the fitness tracker category, there appears to be room for growth. As of last year, 40% of fitness tracker owners made more than $100,000 in annual income, suggesting an untapped opportunity to target consumers at lower income levels. Despite all the hype around wearable tech, success is far from guaranteed for any individual product or product category (Google Glass, anyone?). In some cases, products may fail to take off because they are ahead of their time—one frequently-cited example being Apple’s Newton, the forerunner to the iPhone. I sat down with Ben Alter, Strategy Director at Argonaut Inc., to find out how the agency approaches the task of advertising a wearable technology brand. Are you targeting a different—perhaps wider—audience for Fitbit’s products now than when you launched the company’s first global campaign three years ago? The beautiful thing about Fitbit has always been their democratic approach to fitness. From their inception, they’ve believed that everyone should be able to find their version of fitness, not just the gym rats or traditional athletes. So to answer your question, our audience three years ago is the same audience we are talking to today … anyone and everyone that wants to improve their health. The biggest difference is that now, Fitbit has a more sophisticated portfolio of products for us to capture their full attention. 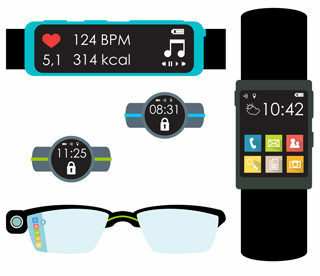 What product features do you think consumers find most important in wearable technology? In the beginning of the wearable movement, it was steps, then it was all about heart rate, and now it’s all about guidance. People have realized that the data means nothing unless they can learn from it and become a better version of themselves. Features are nice on a car, but for wearables, it’s all about the benefit. How does it make me healthier and happier? Fitness trackers and smartwatches are familiar to consumers at this point. What is the next category of wearable tech that you expect to come on the market in a major way? Hearables. Back to my point about people wanting guidance, I think we’ll start to see that audio can bridge the gap between cold data and a more personalized coaching experience. I also think augmented reality is going to come back in a big way. Google Glass was ahead of its time in function but behind the times in fashion. With VR being too immersive for a broader audience, I wouldn’t be surprised to see more innovation in eyewearables. Fitbit has its own internal ad team, the Fitbit Creative Lab. What is your working relationship like, and how do you divide responsibilities? We love working with those guys. There’s so much going on that there’s more than enough work to go around. Typically we develop the above the line marketing materials and the Creative Lab takes on everything below the line. One thing that stands out in particular is working with their creative director and in house writer. They’re a perfect extension of our creative sensibility and help champion ideas within the walls of Fitbit. What is your personal record for steps walked in a day? 37,000. I don’t think I’m ever going to beat that. An original Janis Joplin concert poster. Our office is/used to be The Avalon Ballroom, a very popular music venue in San Francisco back in the 60s and 70s. The poster was from a show she played here.